The first meditation session will start at 10 am. In the morning we will have a longer session, after the lunch from 2 pm there will be two shorter meditation sessions separated by a short 10-15 minutes interval. Under the retreat we will perform the practice of Vajrasattva three times. 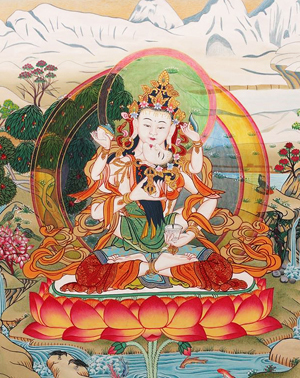 Vajrasatva is a deity functioning universally as a Tantric practice for the purification of sins and defilements. In the preliminary practices of Tibetan Buddhism called Ngondro, Vajrasattva plays an important role as he can dissolve away negative karmic forces that obscure realization. Our religious community follows the tradition of the Sakya Tibetan Buddhism. Our goal is to preserve the complete Buddhist doctrine, to practice it regularly and to make it accessible to interested people throughout the world irrespective of race, religion, nationality or belief. Our resident Lama - Venerable Lama Kalsang was sent by His Holiness the 41st Sakya Trizin in 2006 to Hungary. He bestows initiations and teachings not only in Hungary but also in other European countries. On the afternoon of 27th of March 2010, His Eminence Dungsey Akasha Vajra Rinpoche came into this world in New Delhi, India. His Eminence is the first grandson of His Holiness the Sakya Trizin, and second child of His Eminence Ratna Vajra Rinpoche and of his wife Her Eminence Dagmo Kalden Dunkyi. His Eminence’s birth took place on the 12th day of the 2nd month of the Tibetan calendar, anniversary of the Paranirvana of Jetsun Drakpa Gyaltsen, one of the Five Founding Fathers of the Sakya School of Tibetan Buddhism. His birth was accompanied by a slight earthquake in New Delhi, an auspicious sign that a great being had entered this world. The Sakya Tradition—one of the major Tibetan Buddhist traditions—was founded in 1073 by Khön Konchok Gyalpo, who established the first monastery as the seat of Sakya tradition, at a place called “Sakya” in the region of the Ponpo Ri mountain range. Subsequently, the five Founding Masters of Sakya initiated the common and uncommon teachings and caused the teachings of Sakya including the auxiliary sciences to flourish. Since then, the lineage and its followers have been called “Sakyapa”. The unbroken succession of lineage holders bear the three supreme names of ‘mtshan mchhog gsum ldan’, known as the Celestial Race, the Khön Clan and Sakya-pa. 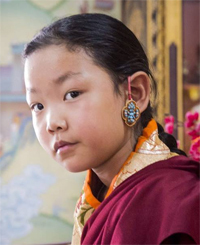 Through them, the great teachings of the Sakya Tradition are preserved and continue to flourish to the present day. His Holiness the 41st Sakya Trizin, Ngawang Kunga Thegchen Palbar Trinley Samphel Wangi Gyalpo, saw with his vast vision that in the current degenerate time it would be beneficial to change the throne holder succession system, even though this diverges from the established Sakya tradition, creating a new era. On 8th May, 2014, the new historical throne holder succession system was unanimously resolved by the Dolma Phodrang and Phuntsok Phodrang, with His Holiness the Sakya Trizin announcing the same on 11th December 2014 during the 23rd Great Sakya Mönlam for Universal Peace in Lumbini. The resolution detailed the tenure, assumption of throne holder position by seniority and the prerequisite qualifications to become the throne holder. The qualification includes the complete fulfillment of studies of all the basic rites and rituals of Sakya tradition, studies in all the major philosophies, receiving empowerments, reading transmissions, pith instructions, mastering the teachings of the ancestral Dharma teachings of Lamdre Tsogshey and Lamdre Lobshey along with other important teachings and empowerments, and having accomplished the basic recitation retreat on Hevajra and other important yidam deities. In March 2017, His Holiness Ratna Vajra Rinpoche, Ngawang Kunga Lodro Wangchuk Rinchen Jigme Trinley, who is endowed with above mentioned qualifications, officially ASCENDED to the Sakya Throne to become the 42nd Sakya Trizin, the first throne holder under the new system. 1986. His Holiness the 41st Sakya Trizin mandates Joseph Kovacs to establish a Hungarian Sakya center called Sakya Tashi Choling. 1998. During his first visit in Hungary His Holiness the 41st Sakya Trizin is bestowing White Tara empowerment, hundreds of people are taking refuge. 1999. Our center is officially registered as church. 2002. 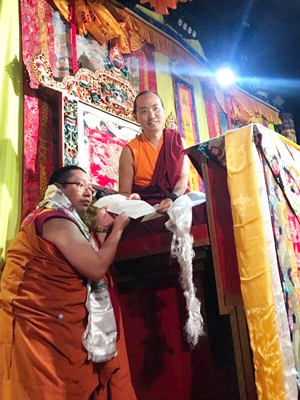 During his second visit His Holiness the 41st Sakya Trizin is bestowing the Major Avalokiteshvara empowerment and the very special Guruyoga with Sakya Pandita empowerment. 2003. During the first visit of Her Eminence Jetsun Kushola is bestowing the 21 Tara empowerment and many people take refuge again. 2004. Renting the first meditation room. 2004. Her Eminence Jetsun Kushola is bestowing White Tara and Vajrapani Bhutadamara empowerments. 2006. Venerable Lama Kalsang our resident lama sent by His Holiness the 41st Sakya Trizin is arriving to Budapest. 2006. Her Eminence Jetsun Kushola is bestowing Hevajra empowerment. 2007. 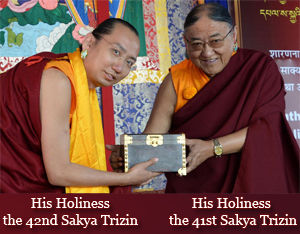 His Holiness the 41st Sakya Trizin is bestowing Rig Sum Gungpo empowerment and teaching us the Gift of Dharma. 2008. Her Eminence Jetsun Kushola is bestowing the very precious Vajrajogini empowerment belonging to the Anutarayoga and giving us the very rare 7 day teaching of Vajrayogini. 2009. Moving to a bigger center. 2010. His Eminence Gyana Vajra Rinpoche is bestowing Mahakala and Kurukulle empowerments. 2011. His Eminence Ratna Vajra Rinpoche is bestowing Vajrakilaya empowerment and teaching. 2014. His Eminence Ratna Vajra Rinpoche is bestowing Avalokitashvara and Kurukulle empowerment and teaching. 2017. His Holiness Ratna Vajra Rinpoche ascended to the Sakya throne to become the 42nd Sakya Trizin under the new succession system. During his first visit in Hungary as the throne holder he is bestowing Guru Rinpoche and Medicine Buddha empowerments and teachings. His Holiness is granting the title of Khenpo (Abbot) to Venerable Lama Kalsang. Since his arrival Venerable Khenpo Kalsang has bestowed us with different empowerments, like Tara, Medicine Buddha,Vajrapani, White Mahakala, Dzambala , Manjushri, Avalokiteshvara and teaches us on regular basis.